Many anglers are familiar with The Rod Gloves and what sets us apart from the other brands is our detailed hand made tapered tip which allows the Rod Gloves to be stored in a rod locker. 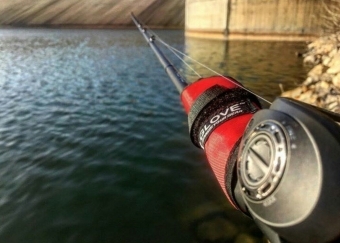 Easy to install, simply slide the Rod Gloves on to your rod, and in seconds your rods are protected from scratching and tangling whether in a tournament, traveling or storage. They are offered in various colors, with the spyders, a combination of black and color being the most popular. But what else does the Rod Glove offer? Let's take a look at the Bait Glove and Rod Glove Saver. Ever wonder how to keep your competitors from knowing what type of lures you have rigged for a tournament? As tournament anglers, we are all very competitive and with money and pride on the line, anglers are apt to do some interesting things at the boat launch including taking a peek at what competitors plan on throwing for the day. The Rod Glove offers the Bait Glove which serves to protect your lures that are rigged on your rods. More importantly, they can keep prying eyes off of your lures as you get ready for the day at the launch. With simple installation, unwrap the Bait Glove and wrap it securely around your lure with the velcro straps it keeps your lures from tangling and anglers from seeing your lures prior to blast off. The Bait Glove is very affordable and offered in various sizes to suit your lures 6", 9" and 12", these rubber backed wraps look great in red and black which makes them easy to find when they are not being used. Not only for tournament anglers, these Bait Gloves are great to use on family fishing trips to keep hooks from being exposed to anyone on the boat. Not sure how to keep your Rod Gloves attached to your rod? If you are concerned about keeping the Rod Glove tied onto your rod either while travelling or storing them on your boat, take a look at The Rod Glove Saver. This inexpensive accessory can be purchased if you have particular set ups that require more secure attachment for The Rod Glove. This product comes with a solid plastic clasp that is easy to open and clamp down onto the Rod Glove and is available in 4", 8" and 12" to accommodate your rod. The attached elasticized band secures easily around your reel handle to keep your Rod Glove snug when travelling or storing in the rod locker. It's never fun to have your Rod Gloves blow away and damage your rod in the process so be sure to pick up some today. Take a look at the video from The Rod Glove Pro Bass Elite Brent Ehrler as he discusses both the Bait Glove and the Rod Saver.